Prime Minister Prayut Chan-o-cha has voiced his concern over the spending discipline of some income earners which he believes to be one of the causes of financial problems among Thai people. 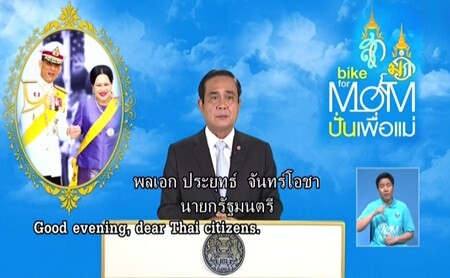 During the government weekly talk program, Gen Prayut commented that financial trouble of Thai people may have stemmed for materialism other than falling agro-product prices or economic slowdown. Gen Prayut said the government was particularly worried about agriculturists, low-wage earners, debtors of non-bank lenders and civil servants. The premier suggested that the public uphold financial discipline and HM the King’s sufficiency economy philosophy to safeguard themselves against indebtedness. He also admired the Royal Thai Army whose debt management program had succeeded in reducing debts and led to efficient financial management among security officials.